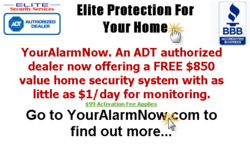 Arizona home security industry has been taken by storm by the recent introduction of low cost home surveillance plans from Elite Security Services. Within their brief tenure in the state, the company has emerged as one of the top service providers for providing leak proof security to households within an affordable price range. The company was formed just about a year ago by acclaimed home protection expert Paul Shakuri. Since the inception of the company, they have been extremely proactive towards developing security systems that can be afforded by common homeowners. Elite Security Services presently offers three domestic protection packages priced at $35.99, $40.99, and $44.99. In spite of offering an affordable price range, the company has done well to provide advanced home protection facilities with all their packages. Unlike most other Arizona home security companies, Elite Security Services operates with a much larger vision than just selling home surveillance plans. Led by the charismatic owner Mr. Shakuri, the company has made a significant contribution towards promoting security awareness amongst the Arizona residents. With this purpose, the company maintains their home security blog to share important information pertaining to keeping the house safe from externalities. Offering security plans for rock bottom price is also a part of their initiative to enable all homeowners to provide protection to their life and property. Talking about the overall state of Arizona home security, Mr. Shakuri says, "Like all other parts of the country, domestic security is a leading concern in Arizona, too. This is why all households now require surveillance system for their home. We are committed to play our part in creating security plans that are priced keeping the common buyers in mind". The economical protection facility offered by the company has not only provided the much needed security to the households, but have also created consciousness amongst homeowners about home protection.